Bacon is, I think, one of the staple foods of mankind. Is there anyone in the world who can resist the smell of sizzling bacon? I know people who are vegetarian… Except for bacon. People who gave up being vegetarian… For bacon. An alien from outer space might wonder why – in the era of freezers and food flown to us in airplanes – we would possibly resort to the ancient preservatives of salt and sugar, but surely one bite and they would understand? This makes it more surprising that I’ve never tried to make it myself. But, when a friend handed me a pot of sodium nitrite and said I wouldn’t look back, I decided to give it a go. I’ve had a large slab of pork belly curing in my fridge for the last week, and we unwrapped it and had some for breakfast this morning. I can honestly say it was the best bacon I’d ever eaten – better by far than the stuff from the local butcher or the farmers market, never mind the pallid, slimy wafer thin slivers that the supermarket calls bacon. It was so good that I ate every bit and completely forgot to take any post-cooking photos! So, to make up for it, I hot smoked a good chunk of it to be sliced into lardons and eaten in a salad, of which I do have some pictures. It was a real hardship…. 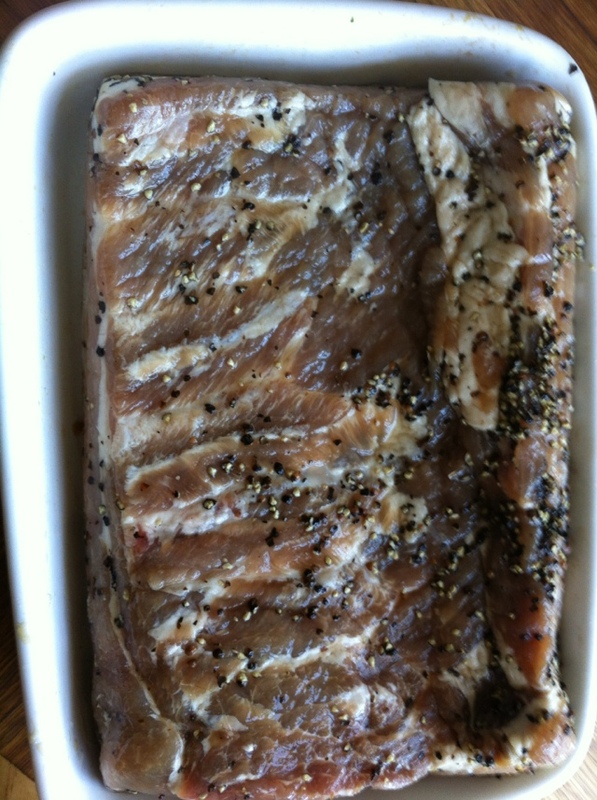 Trim the pork of any dry bits, silverskin or glands. Mix the dry cure ingredients together thoroughly, and rub all over the pork, being careful to work it into all of the crevices. 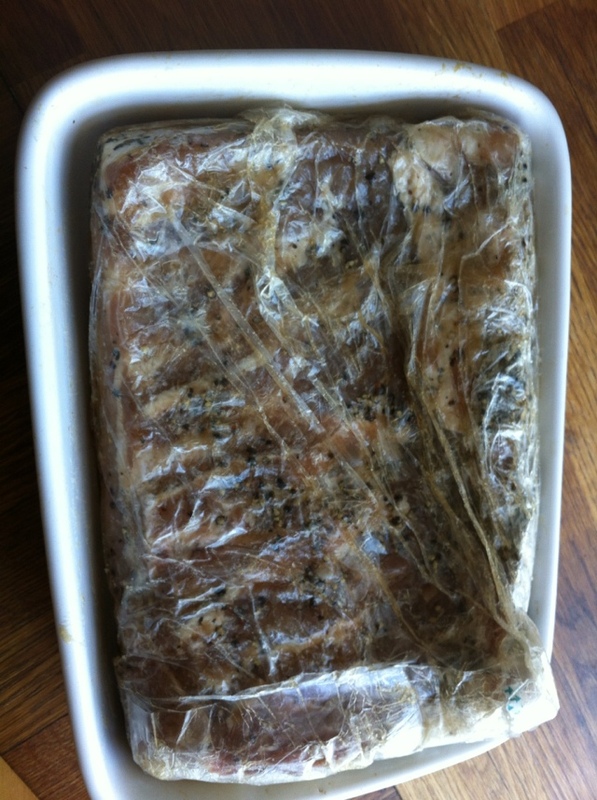 Pop the meat into a ziplock bag along with any leftover cure (or put in a small dish and cover with clingfilm, but the bag will mean less hassle later). Now put the meat in the fridge and leave it there for a week, turning every day to re-distribute the cure. Some moisture will leach out of the meat – this is normal, and the meat should be allowed to sit in it. Once the seven days are up the meat will feel much firmer than it did before you cured it. Unwrap it, discard the curing liquid, rinse the cure off the meat and pat it dry with paper towels. That’s it! Slice thickly, fry and devour… It will keep for three days in the fridge, or it freezes very well. You can experiment adding things to the cure too – I used some black pepper, but you could add some extra brown sugar or maple syrup for a sweeter cure, or finely chopped chives, or even some crushed cloves and honey. Next time, I might try some finely chopped wild garlic. 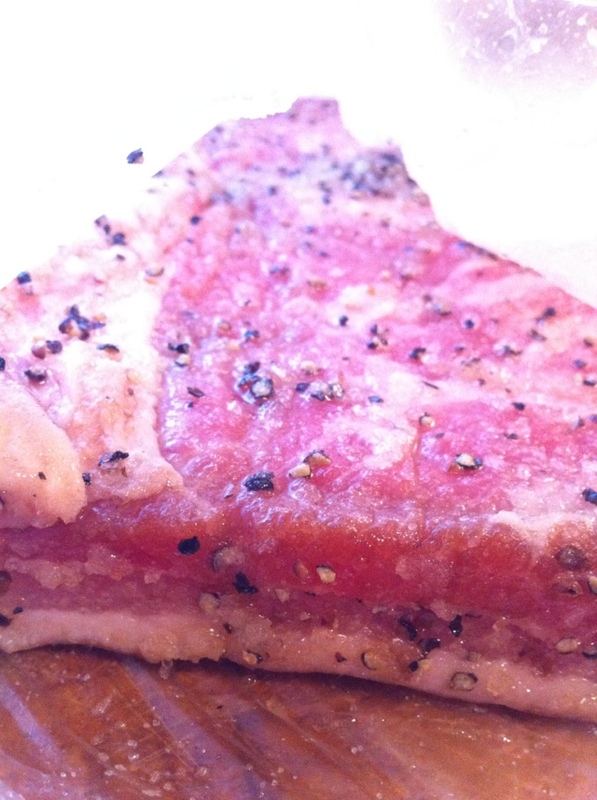 Once the skin was off, I chopped it into lardons and sizzled them in a pan. 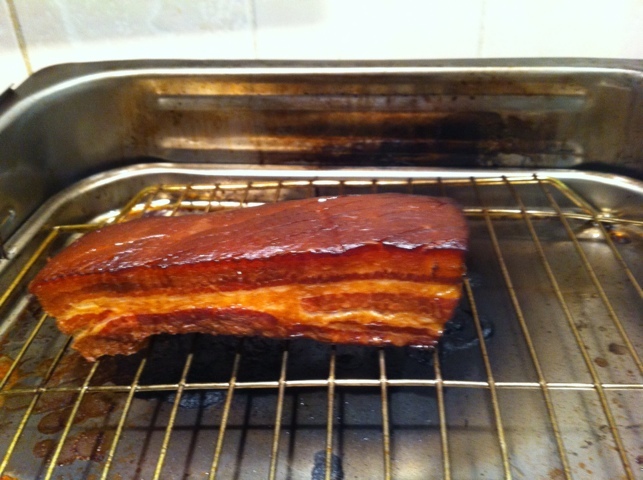 They don’t need any oil to cook in – plenty of pork fat rendered out of the lardons to make them lovely and crisp. 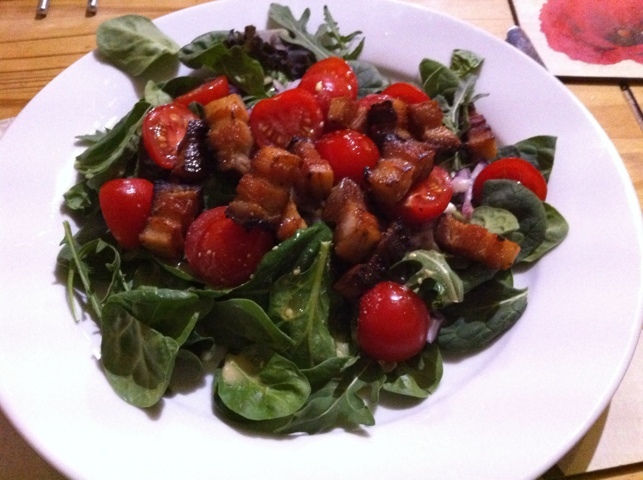 It seemed a shame to waste something so flavourful, so I skipped the olive oil in the salad dressing and just drizzled a bit of pork fat over the salad instead.